I am a Computer Staff Scientist in the Scientific Data Management Group at Lawrence Berkeley National Lab (LBNL). My research interests are in scalable scientific data management. More specifically, I am interested in parallel I/O, data management systems for managing scientific data, and heterogeneous computing. I am also interested in energy efficient parallel computing. Before joining LBNL in Nov 2010, I was a researcher at NEC Labs America, where I was a part of the Computer Systems Architecture Department (now Integrated Systems) and was involved in the Heterogeneous Cluster Computing project. Even before that, I was a Research Assistant Professor in the Department of Computer Science at Illinois Institute of Technology (IIT). I was also a Guest Researcher at the Math. 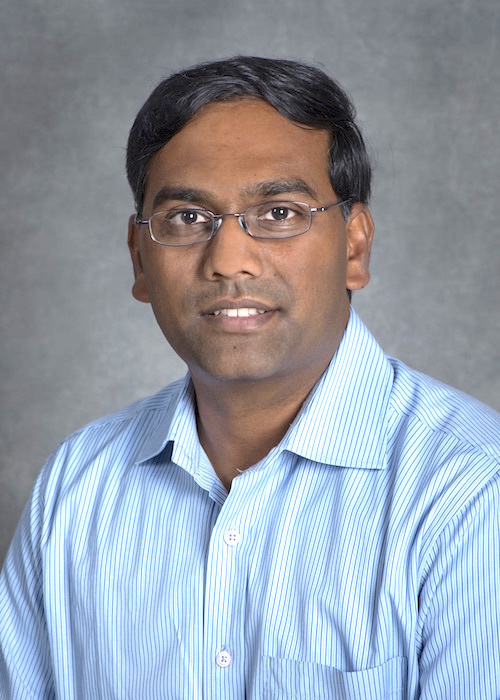 and Computer Science division of Argonne National Laboratory and a Faculty Member of the Scalable Computing Software Laboratory at IIT. I received my Masters and Ph.D. degrees in Computer Science from Illinois Institute of Technology, Chicago. Jialin Liu, Yong Chen and Suren Byna, "Collective Computing for Scientific Big Data Analysis", Eighth International Workshop on Parallel Programming Models and Systems Software for High-End Computing (P2S2), 2015, in conjunction with ICPP 2015. Michael Wehner, Surendra Byna, Prabhat, Thomas Yopes, and John Wu, "Atmospheric Rivers in the CMIP3/5 Historical and Projection Simulations", In World Climate Research Programme (WCRP) Workshop on CMIP5 Model Analysis, Honolulu, HI, USA, March 2012. Poster. S. Byna, J. Meng, A. Raghunathan, and S.T. Chakradhar "Best-effort Semantic Document Search on GPUs", Technical Report, NEC Laboratories America (2010-L021), Jan 2010. M. Becchi, S. Byna, S. Cadambi, and S.T. Chakradhar "Data-Aware Scheduling of Legacy Kernels on Heterogeneous Platforms with Distributed Memory", Technical Report, NEC Laboratories America (2010-L015), Jan 2010. S. Cadambi, A. Majumdar, M. Becchi, S. Byna, S.T. Chakradhar, and H.P. Graf, "A Massively Parallel, Smart Memory-based Accelerator for Data Analytics", Technical Report, NEC Laboratories America (2009-L157), Nov 2009. J. Meng, A. Raghunathan, S.T. Chakradhar, and S. Byna, "Scalable Parallel Execution of Recognition and Mining Workloads through Data Dependency Relation", Technical Report, NEC Laboratories America (2009-L120), Jul 2009. Best Paper Award for "Accelerating Science with the NERSC Burst Buffer Early User Program", at Cray User Group meeting (CUG 2016), London, UK, May 2016. Juelich Supercomputing Center prize for the best application of HPC technology in solving a pattern recognition problem for "TECA: Petscale Pattern Recognition for Climate Science", at the 16th International Conference on Computer Analysis of Images and Patterns (CAIP) 2015. Best Paper Award for "Trillion Particles, 120,000 cores, and 350 TBs: Lessons Learned from a Hero I/O Run on Hopper", at Cray User Group meeting, Napa Valley, CA, May 2013. 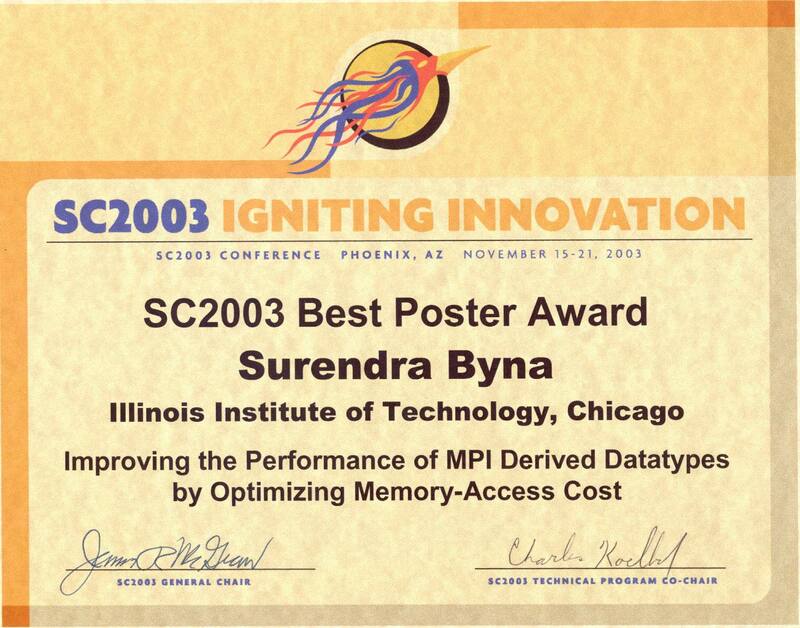 Best Paper Award Nominee for "Hiding I/O Latency with Pre-execution Prefetching for Parallel Applications", at IEEE/ACM Supercomputing 2008 (SC08), Austin, USA, November 2008. Parallel I/O Kernel (PIOK) Suite: ExaHDF5 I/O kernel suite contains I/O kernels extracted from real applications from plasma physics, accelerator physics, climate modeling, etc. How to cite: Suren Byna and Mark Howison, "Parallel I/O Kernel (PIOK) Suite", available at https://sdm.lbl.gov/exahdf5/software.html, 2015. IO-SIG: Generates IO-Signature, a pre-defined notation that can provide simple and clear representation of data access patterns in parallel I/O applications.